The undefeated flight for the Rowan University football team touched down Saturday in Glassboro. Eleventh ranked Frostburg State University defeated the Profs 24-10 in game that had a playoff atmosphere to it. Frostburg’s second drive started with their worst field position all game at their own 15 yard line. However, quarterback Connor Cox delivered a deep ball that was tipped into the hands of wide receiver Joe Beckford for a 59-yard touchdown with under three minutes left in the first quarter. Rowan responded early in the second half with a 22-yard field goal from kicker Tyler Knighton. 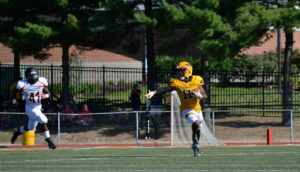 With the help of stout defense and excellent ball movement, the brown and gold’s offense made great strides down the field including a 13-play, 95-yard drive capped off with an 11-yard touchdown pass from Naldy Tavarez to Jamel Smith. The momentum felt as if it had swung in Rowan’s favor going into the locker room as they held a 10-7 lead. However, two more touchdown passes from Cox and a 19-yard field goal lead the Bobcats to shutting out Rowan 17-0 in the second half and earning a win that has them tied with Salisbury University for first place in the New Jersey Athletic Conference standings. Cox didn’t have an efficient day completion percentage wise going 13-of-25, but he made the big plays in the clutch moments with 238 passing yards and three touchdowns. The top run defense in the nation was as advertised, holding the Profs to just 46 yards rushing. Running back Anthony Diorio had 21 carries for just 54 yards, ending his streak of 100-yard rushing games at three. The passing game struggled just as much as the ground game, as Tavarez threw a career-high 33 attempts completing just 17 of them for 168 yards and a touchdown. One positive takeaway is that 10 of those completions were to Smith for 79 yards and the score. Defensively, outside linebacker Godwin Asamoah totaled six tackles, a sack and a forced fumble. He enjoys being a part of the front seven group that is able to apply a lot of pressure. The Profs and the Captains are tied with each other for fourth place in the New Jersey Athletic Conference and neither team wants to slip down another spot in attempting to stay in the conference title picture. Since Christopher Newport entered the conference in 2015, Rowan has come out on top in the two meetings. For questions/comments, email sports@thewhitonline.com or tweet @thewhitonline. Next articleWhy do you need hope?